Dansazania is a group in South Africa which teaches dance lessons to underprivileged children. We have both collected and donated hundreds of our SBD Sportswear leotards and donated dancewear to this cause. It brings us such joy to see the children benefit from wearing leotards when they are used to dancing barefoot and in street clothing. 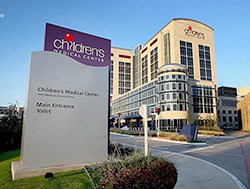 Children's Health of Dallas: We have donated our blankets and blankies to both the children's cancer unit as well as the NICU at Children's Health, Dallas. Parents and children can be both scared and sad during a hospital stay. Our blankets have brought comfort to hundreds of patients over the years.